With September already in full spark, there are lots of new drones to choose from. Some of them fall in the entry level category but bear solid specifications. Others, on the other hand, are a bit pricier but possess unparalleled performance as compensation. However, there are also newly released drones that are priced high but possess mediocre performance. As a matter of fact, John, one of our staff members, got hooked on a new toy-grade drone only to receive it DOA (dead on arrival). So yeah, what I’m basically trying to say here is that you should know what you’re looking for otherwise you’ll end up like John. You know how that old meme goes – Don’t be like John! That’s why I’ve done a research and am presenting you with the best-selling drones in first 2 weeks of September 2017! The lists are relatively short (3 entries in each) but will still serve as proper guidance on what to expect from similarly priced drones. Each and every one of drones listed below is well-capable and provides great value for money. It’s on you, however, to decide whether you’re going for a toy-grade or premium drone… There’s no space for my opinion in that decision. Starting off with cheap drones, at the third spot we have the previously mentioned Air Wars Battle Drones. This is not a single drone but 2 drones combined… and my oh my, they will produce a ton of fun, especially if you have children. As a matter of fact, this is a completely new concept to toy-grade drones and I really believe it will make a proper name for itself on the market. For now, let’s see what exactly can these little drones do! First things first, one thing needs to be settled before we even get into these quadcopters – these drones aren’t meant for amateur aerial photography or amateur FPV racing. Nope – they are meant for drone battles! You read that right! Within the package you will find a total of 10 mountable weapons including pikes, shuriken, grappling hooks, buzz saws and all that good stuff. With a simple snap-on mechanism, you’ll be able to place these weapons onto your drone and the fun can start. Besides these weapons, the package also sports 8 extra props so you can replace them after several demanding battles. The frames are surprisingly durable and, believe it or not, possess 4 specialized attacking moves. Heads up though – most of the time it will be difficult to announce the battle winner since both of these drones usually fall down at the slightest contact. But, this does not mean they’re not fun! Come to think of it, I cannot remember when was the last time I had so much fun with drones that cost less than an extra battery for my main driver. Crazy! This is another upgraded version of UDI’s insanely popular U818 model. This time around, the folks over at Drocon made a few incremental improvements in terms of imaging quality. Besides that, you’ll also notice a bulkier frame with built-in (extremely thick) prop guards that will ensure the safety of your drone even after high speed crashes. That’s about it as far as the introduction is concerned – now let’s take a closer look at it and see what’s it all about! Drocon U818Plus sports an integrated camera that’s mounted on an anti-vibration dampening rubber. Additionally, it also sports optical anti shake technology which does somewhat of a good job in terms of eliminating jello and shakiness from your aerial footage. However, the camera can only record in 720p which is kind of too low for today’s standards. But, considering the low price of this model, it’s still a worth a try for people wanting to take on amateur aerial photography. In terms of actual performance Drocon U818Plus works amazingly well. That’s partially because of its proprietary 2S 1000mAh LiPo battery which can keep it in the air for up to 15 minutes. Furthermore, the operating range is solid too, especially considering this is a toy-grade drone. 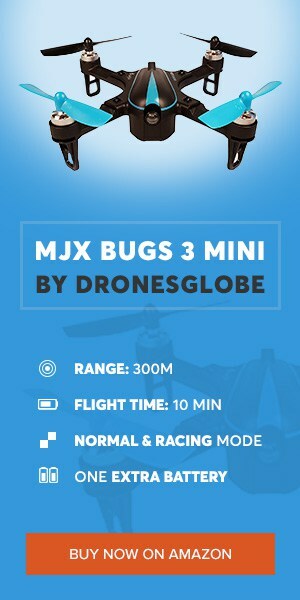 You’ll be getting around 50 to 60 meters of range as well as WiFI FPV which can be used via FlyingSee app which is downloadable for your smartphone device. All things considered, Drocon did an exceptional job with U818Plus and you should definitely be considering going for it. Get ready for the best-selling toy-grade drone in September 2017 – Altair AA108! This is a brand-new drone that has just been released but it’s already receiving a ton of praises. Everyone seems to love and, thrutfully, I’m among those people too. Been playing around with it ever since it got released and I have to say that it’s a tiny little miracle! With solid performance and a great set of entry-level features, Altair AA108 has everything it needs to be crowned the best toy-grade drone not just in September but in the entire 2017! Starting off with the packaging, Altair AA108 packs quite the punch with a set of extra props, an extra battery and tools required for regular drone maintenance. Moving forward, the graphics on its canopy are also a sleek touch as they give out a quality feel to the build. Prop guards are noteworthy too as they’ll save you the trouble of replacing propellers after every consecutive crash. Camera, on the other hand, is purely brilliant for the price tag and can record in 720p. When it comes to its respective specifications and features, Altair AA108 fares pretty well against other similarly priced drones on the market. It can fly as long as 10 minutes and move up to 100 meters away from its controller. However, the WiFi FPV only works for roughly 30 meters so bear that in mind if you don’t want to lose your drone due to flying out of FPV range. Lastly, Altair AA108 sports altitude hold and 3 speed modes as its main features. In addition to those, there is also custom flight route function which is basically a poor-man’s version of waypoints. It works as it should but don’t expect any advanced settings on it. Now that you’ve taken a closer look at 3 awesome toy-grade drones, it is time for some big guns! 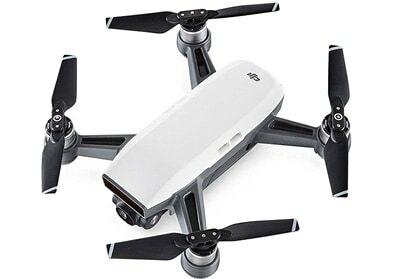 These next 3 entries provide excellent all-around performance but are travel-friendly… and that’s something many people prefer over big bulky drones which require their dedicated carrying cases. So yeah, September has been in the sign of high performance portable drones. Let’s take a look at the best ones, shall we?! Out of these 3 “expensive” drone, GeniusIdea Follow is the newest (and cheapest) one. It just came out and has already started making quite the name for itself on the market. That’s because it sports innovative design and build materials which put it miles ahead of all similarly priced competitors. Plus, it’s travel-friendly too, providing the best combination for this month of college and school travels. The first thing that needs to be stated about GeniusIdea Follow drone is its amazing build material. We are talking about an extremely durable rubber(ish) materials that can bend, twist and turn without losing their initial shape. This protects not only the frame of GeniusIdea Follow but its propeller s well, which are also made out of that same highly-durable material. So basically, even if this birdie falls from 50 feet up straight onto a concrete pavement, chances are high it will survive as if nothing had happened. Still, don’t test this out and blame us – do it at your own risk. GeniusIdea Follow’s camera is also a noteworthy aspect of the entire package. You see, this is a fully fledged 4K sensor that’s able to capture magnificent aerial footage. Combine that with a stellar array of features including Follow Me Mode (who would’ve guessed, eh? 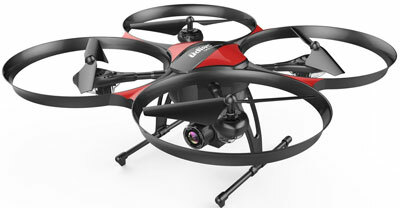 ), circling flight and even gesture recognition, and I’m sure you’ll realize what a bang for your money this drone provides. 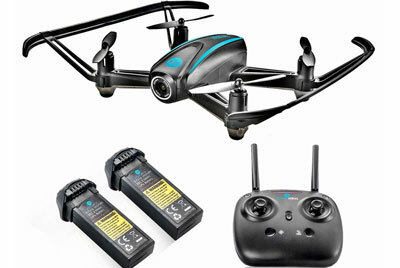 Last but not least, this drone can stay in the air for up to 20 minutes due to its 2500mAh battery. Flight range, however, shows that this is not a scout drone with only 100 meters of worry-free range. Despite that, I still believe GI Follow provides the best value for money in medium-end market. As a matter of fact, I’d say this birdie provides with high-end performance for a mid-tier price. Amazing! DJI Spark is the newest drone coming from DJI. Well, that is, if we don’t count those 2 new alterations that go by the names of Phantom 4 Obsidian and Mavic Pro Platinum. But, those 2 are not the topic of this section – DJI Spark is! And what better way to start this off than by stating that this is DJI’s smallest ever drone… which is still better than the majority of high-end scene. Let’s talk more about that! Before getting into the specifications (since that’s where DJI Spark shines the most), first we will say a few words about its features. You see, DJI Spark integrates full support for DJI GO app which gives a whole bunch of functionality at its disposal. Besides the usual telemetry data, there are also tons of features including PalmControl and PalmLaunch which are bound to amaze you with their fluidness… Especially with the newest update which made them even better than before. In addition to that, it is also noteworthy to mention Spark’s ability to charge straight from a power bank. Yes, it sports a mini USB plug that allows charging on the go. How’s that for portability, eh? Moving forward to the camera, DJI Spark boasts with a crystal clear 2-axis gimbal/camera combination that can record in fluent 1080p resolution. Along with hardware image stabilization and several adjustable photography modes, there’s no doubt this thing can provide professional quality footage. Lastly, specifications! If you opt for the DJI Spark Fly More Combo, in addition to a whole fleet of accessories you will also get the dedicated controller which lets it fly for supposedly 2000 meters. Airtime is no slack either with roughly 15 minutes of flying per single charge. Finally, we have reached the most expensive and best-selling drone of September 2017. As a matter of fact, DJI Mavic Pro has been at the first place basically ever since it was released, taking the throne off of DJI Phantom 4 that was getting too comfortable at the top spot. 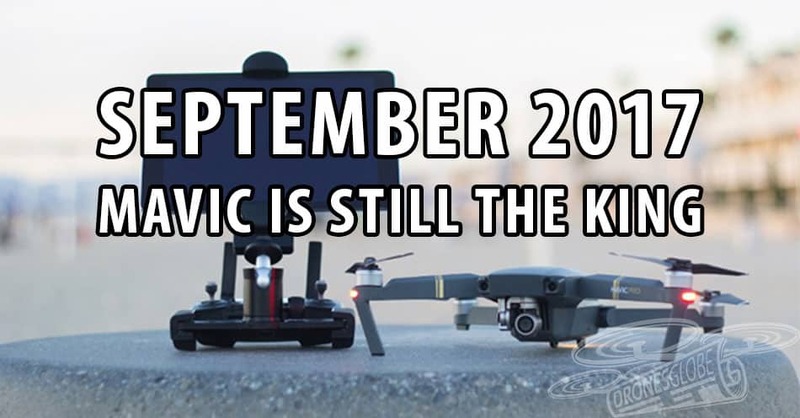 Since then, lots of new models have emerged on the scene but DJI Mavic Pro’s sales are not dropping down a pinch. So, with that said, I’ll take you through the basics of what makes this little birdie so popular… and is it worth your money! First things first, this birdie packs an insane amount of punch for the price… and size! Basically, DJI Mavic Pro incorporates the same performance as DJI Phantom 4 but in a much smaller package. We are talking about 7 kilometers of operating range and up to 27 minutes of flight time. However, if you opt for DJI Mavic Pro Platinum version, you will get additional 3 minutes of airtime due to ESC optimization. Plus, with the addition of brand new propellers, the sound is lowered by 60%. Camera is not to be taken for granted either – DJI Mavic Pro sports an incredibly tiny 3-axis gimbal plus camera combination which records buttery smooth 4K videos. Image stabilization is unparalleled and you can expect professional-grade recordings each and every time. Stepping away from specifications and camera, it is time to say a few good words about the features that come integrated with DJI Mavic Pro. As usual, this birdie sports full DJI GO app support which gives you a whole plethora of autonomous flight modes, some of which are bound to keep you busy for quite some time, trying to capture that perfect scene. Of course, DJI Mavic Pro is GPS-enabled and has altitude hold, but I suppose these 2 are the most basic features you’d come to expect from the Chinese drone giant DJI. What would you like to change on our website? 5 second Poll that can change everything!